You are a newcomer to a village populated with animals. You arrive without any money, so you are given a home by local businessman Tom Nook, and you have to work to pay him back. Wild World adds some new features to the village. The museum includes an observatory where you can draw constellations, and a new coffee shop is run by Brewster. You can buy haircuts, hats and other accessories to further customise your player. You can use the Nintendo Wi-Fi Connection to travel to friends' towns. 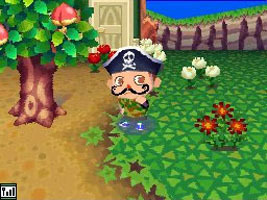 This brings new fruit, items, constellations, and characters to your village. You can also visit other villages over the local wireless connection. The three sacred golden triangles of Power, Wisdom and Courage from The Legend of Zelda series. When activated, it plays the Great Fairy/File Select theme. The legendary sword with blue hilt from The Legend of Zelda series. When activated, it plays the Zelda item fanfare. The energy-sucking alien parasite from the Metroid series. It is in a container, based on the opening of Super Metroid. When activated, it plays the Metroid theme. The combat space fighters from the Star Fox series. When activated it plays the Star Fox theme. Three Pikmin stalks sticking out of the soil of a rectangular plant pot, from the Pikmin series. This item is only available as a gift from Nintendo. Captain Falcon's racer from the F-Zero series. This item is only available as a gift from Nintendo. An upright arcade machine. The screen seems to show a polygonal 3D fighting game starring Mario and Luigi of the Mario series. A blue bench featuring the Nintendo logo. A pink shelving unit with a GameCube and controller on the top shelf. One of the furniture sets is modelled after sprites from Super Mario Bros. All of the items in this furniture set are only available as gifts from Nintendo. A red shirt featuring Mario's "M" logo. A green shirt featuring Luigi's "L" logo from the Mario series. A red shirt with white spots, named after Toad from the Mario series. A red cap with an "M" emblem, based on Mario's hat. A green cap with an "L" emblem, based on Luigi's hat from the Mario series. A curly moustache, based on Mario's moustache. A blue baseball cap named after the "1UP" phrase, meaning an extra life, from Super Mario Bros.
A light blue hat with a picture of a dolphin and the word "Dolphin" on it. Dolphin was the working title for the GameCube, and references to the name have appeared in many Nintendo games. The "SMB3 Paper" stationery features the background from the titles screen of Super Mario Bros. 3. A lazy alligator who wears Mario's "Big Bro's Shirt". His default catchphrase is "It's-a ME! ", after one of Mario's catchphrases first used on the title screen of Super Mario 64. A lazy penguin wearing the "G Logo" shirt. The name and shirt are both references to the GameCube. A cranky frog character whose name suggests a reference to Wart, the final boss of Super Mario Bros. 2. In Japan, this character's name is Sam. Once a day, a rock in your town will drop Bells when hit. If you hit it fast enough, the last three strikes will play the 1UP sound effect from Super Mario Bros.
"Hey… what are Luigi's clothes doing in here?" A reference to Luigi from the Mario series. "You found 50 rupees! Very nice! Too bad you can't use them in this town…"
A reference to the rupees from The Legend of Zelda series. The original design shirts in the Able Sisters' shop are said to be designed by "Treehut", a reference to Nintendo of America's "Treehouse" localisation team. "I'm really into that lab on the back of Nintendogs. He's pretty dreamy!" Throughout the game, the female snooty type characters will refer to a glamour magazine called "Ms. Nintendique", a pun on Nintendo's name. "A cute boy in green clothes who could knock items out of the sky with his boomerang. Why doesn't Tom Nook sell magical boomerangs?" Gulliver, who in this game is a space traveller, sometimes mentions that he has met a fox who rides in ships and a bounty hunter, referring to Fox McCloud from the Star Fox series and Samus Aran from the Metroid series. When Katrina is reading your fortune, she will call out the word "Hokotate". This is the name of Captain Olimar's home planet in the Pikmin series, as well as the street address of Nintendo's Japanese headquarters. "Uh oh, you already know four emotions. Would you like to forget one in order to learn another?" "Which emotion would you like to forget?" "Alright, one, two, three…SHRUNK!! You have successfully forgotten [emotion]"
This is parodying the Pokémon series, where each Pokémon can only remember four moves.